Gather your friends and prepare for adventure in the Star Wars galaxy! 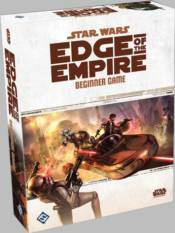 Whether youre new to roleplaying games or just new to Edge of the Empire, the Star Wars�: Edge of the Empire� Beginner Game is the perfect starting point.The Edge of the Empire Beginner Game features a complete, learn-as-you-go adventure and contains everything three to five players need to roleplay on the edge of the Empire. Pre-generated character folios keep rules right at the your fingertips, while custom dice and an exciting narrative gameplay system make every roll into a story. Detailed rules provide for hours of entertainment in a galaxy far, far away! While the Edge of the Empire Beginner Game can be enjoyed by players of any skill level, it is designed for players new to roleplaying games.